Today’s guest is children’s author, Suzanne de Montigny. 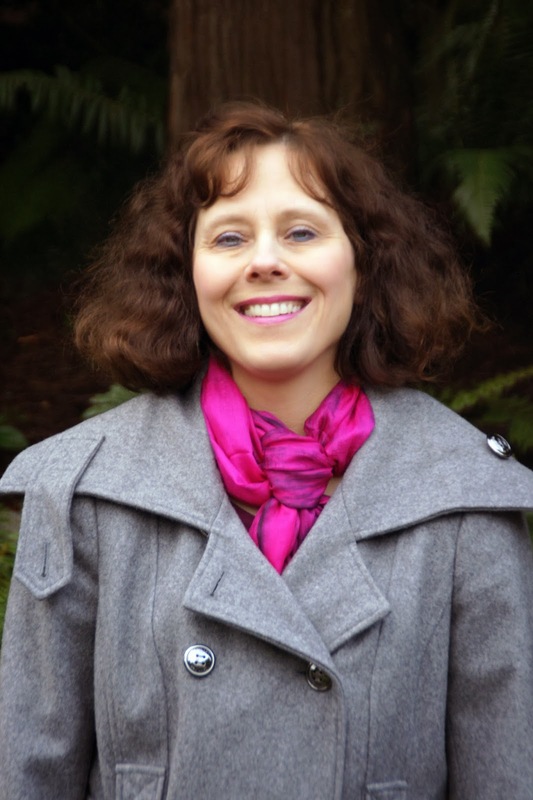 Welcome to Strands of Thought, Suzanne! Can you tell us a little about you, please? I was raised in the beautiful Fraser Valley near Vancouver, Canada, surrounded by jagged mountains. I was piano girl and initially began a career in music, writing scores for television and countless industrial and corporate videos. Eventually, I drifted into education where I learned I could weave a good story that kept the kids asking for more. When I married at 39, and began a family, I decided to stay home. During this time, my father died and I was hit with a tremendous need to write. In the basement, I found an old unicorn story I had written in grade six, thus re-igniting my love for unicorns. 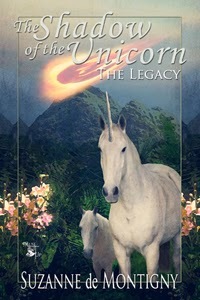 The Shadow of the Unicorn: The Legacy is the first of a three-part series for tween-aged kids. I was very pleased when it won a gold in the 2013 Global E-Book Awards for Best Fiction/Alternate History. Wow, sixth grade! That is a story a long time in the making. Congratulations on the award. Tell us about your most recent book, Suzanne. I am also working on the second of the Shadow of the Unicorn series at present. No spoilers other than to let you know they find Darius-the-seer again. Then, there’s my teen novel, A Town Bewitched nearly ready to go. Kira, a child prodigy in classical violin struggles to fit into the small town of Hope, Canada. When her father dies, a mysterious fiddler with no past appears at his funeral. Within days, the fiddler takes the people by storm with her mesmerizing Celtic music. When someone vandalizes the town, leaving dead and gutted birds as a calling card, only Kira knows who the perpetrator is. · top 3 recommended books for tweens and teens? Tex the Witch Boy, by Stuart R. West is one of my favourites because the story is based on real bullying situations. Not to mention you simply can’t put it down because it’s so good. I think this is a must for every teen to read. If I Could Be Like Jennifer Taylor, by Barbara Ehrentreu is a must-read for teen girls because it deals with the pressures the so-called popular girls go through and how it’s not all peaches and cream. Mostly, it shows teens the horror of bulimia. In A Pickle, by Beth Overmyer is a wonderful story of a boy who keeps traveling back to the same time where he meets a homeless man. The tale really opens wide the eyes of anyone who hasn’t thought of how homeless people got to where they are – on the street. My son loved this book, and so did I. · 3 professions you thought you’d like to do as a child. In 1964, I thought I’d like to be a farmer’s wife. After all, I loved animals and thought it’d be fun to have cows and pigs and horses. In 1968, I dreamed of being the first astronaut to land on the moon. My dream was dashed the following year when Neil Armstrong and Buz Aldrin took the first giant steps for humankind. In my teens, I wanted to be a composer and professional pianist. I did it for several years, but it didn’t pay the bills very well, so I drifted into teaching music in the public school system where I was quite happy for 20 years. · 3 people you admire the most in the world? Well now, don’t laugh. Queen Elizabeth II simply because she can stand up and do the right thing through a lot of controversy. The dame has class! Mother Teresa. I know she’s passed away, but if you’ve ever seen the poverty in India (they have 31,000,000 orphans) and the work she did…it fills my eyes with tears. My own dad, Dr. Pol de Montigny. He died seven years ago, but when he was alive, he inspired so many people to make something of themselves. He really cared about people and that’s how I want to be. It’s also available on iBooks, Barnes and Noble, and Smashwords. Thank you for charming us on this week’s Three Times A Charm! Best of luck to you and your writing, Suzanne. Great interview, Suzanne and Kai! Your books sound very interesting, Suzanne. I have "The Shadow of the Unicorn" on my Kindle, but haven't gotten to it yet. Let me know when "A Town Bewitched" comes out. I got chills just reading the blurb! So glad you stopped in, Beth! It's fun to find out details about authors. Suzanne, you're a very interesting person. I'm looking forward to more of your unicorns. Shadow of the Unicorn was a very good read. Best wishes. So glad you stopped in! Thanks, Sharon, as were your books. Great interview.....I've read Suzanne's Shadow of the Unicorn - Great read! Kai - I love the idea of your Three Times The Charm! Very cool site! Glad you enjoyed the interview, Penny. I'm always looking for children's lit guests! I like the new format idea as well, Kai. Great interview you two! I, too, enjoyed Shadow Of The Unicorn and look forward to the sequel. But the one I really want to read is A Town Bewitched! Oh, and thanks for giving my book another shout-out, Suzanne! Thanks, Stuart! Good of you to stop in, sir! You're welcome, Stuart. Planning on reading your second one in a few minutes once I climb into my PJs. Suzanne, great interview. I have your book, but I haven't read it yet. I am honored you have put my book in the top 3 for teens! Thank you so much!! Very inspiring interview. I had no idea there was a "Fraser Valley." Since Fraser is my maiden name, I just may have to go see it! You could make a fun destination vacation out of that, Heather! Appreciate you stopping in. Barbara, your book deserves it. And Heather, yes it's a very beautiful valley east of Vancouver. I didn't appreciate it then, but do now. You stole my answer -- I too admire Queen Elizabeth II immensely. I've been a fan for a number of years, and just last week finished reading her biography (by Sally Smith). Your Shadow of the Unicorn series sounds so whimsical. I remember being enchanted with unicorns when I was in middle grade myself. Loren, my mom's name was Sally Smith. I love any reminder of her, especially unexpected ones. So glad you stopped in! Kai, thanks for this great idea of threes. I learned so much about Suzanne from this interview. Suzanne, I'm sure your dad left a legacy of caring about people which you inherited and live everyday of your life. Love Shadow of the Unicorn. Very special story. So glad you stopped in, JQ! Hey LRS, you won a copy of SHadow of the Unicorn. Could you please contact me at sfierymountain@gmail.com so I can send it to you?